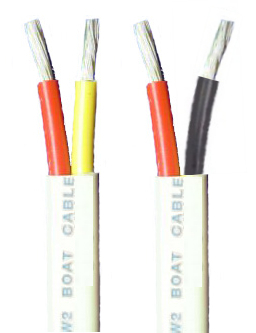 Marine Duplex cable is various insulated single conductors are extruded together, in parallel with a tough PVC jacket. Type III stranded. Designed to meet SAE, ABYC, UL and Coast Guard requirements, 600 volts, 105ï¿½C dry, 75ï¿½C wet. Safety standards for electrical and gasoline fuel systems CFR 33 Part 183. (BC-5W2).